Dr. James Evans graduated medical school from University of Alabama School of Medicine and completed his residency program at Wake Forest University. A fellowship in hematology/oncology followed at University of Mississippi Medical Center. Dr. Evans is now specialized in oncology and board certified in internal medicine and medical oncology. 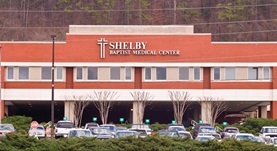 He has been in practice for more than 6 years and is affiliated with Shelby Baptist Medical Center. During his career, he has also published one writing of medical interest in collaboration with other doctors. Dr. James Evans has contributed to 1 publications. Homologous recombination is the principal pathway for the repair of DNA damage induced by tirapazamine in mammalian cells. Evans, J. W.,Chernikova, S. B.,Kachnic, L. A.,Banath, J. P.,Sordet, O.,Delahoussaye, Y. M.,Treszezamsky, A.,Chon, B. H.,Feng, Z.,Gu, Y.,Wilson, W. R.,Pommier, Y.,Olive...; Cancer Res.. 2008 Jan 04.